Disclaimer: The Lark Studio LSXC sent to us is a sample in exchange for our honest opinion and initial impressions. We thank the team at Lark Studio for giving us this opportunity. 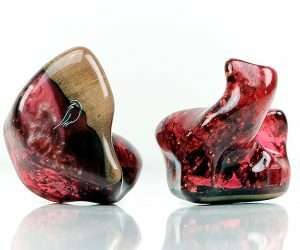 This is our first Lark Studio product feature on Headfonics but if you wish to read up on our custom monitor section you can start here. 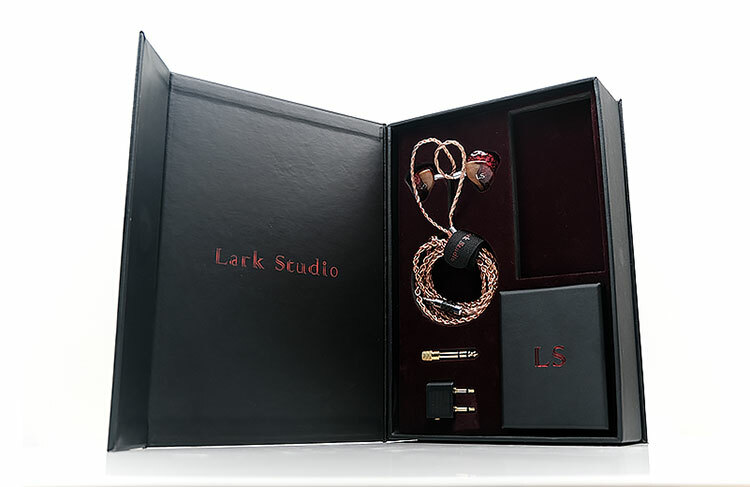 Lark Studio just sent us their freshman custom monitor, the LSXC (LSX in universal) and we thought it would be nice to give you a short teaser before the main review post-Chinese New Year. You may not have heard of Lark Studio before. As a company, I only heard of them last year when I started seeing pictures of their monitors crop up on social media. It was through Phil Wannell and Audio Concierge that Michael of Lark Studio approached us about listening to the LSXC and giving our opinion on it. Why not indeed. The reason why I decided to bring these in is because of their background in the monitor sector. They are not new to this business. In fact, the three founding members have around 18-20 years’ experience between them with various audio companies. You can read more about the company and their philosophy in some detail here. The LSXC is the only monitor they currently offer though I am told new ones are in the works. 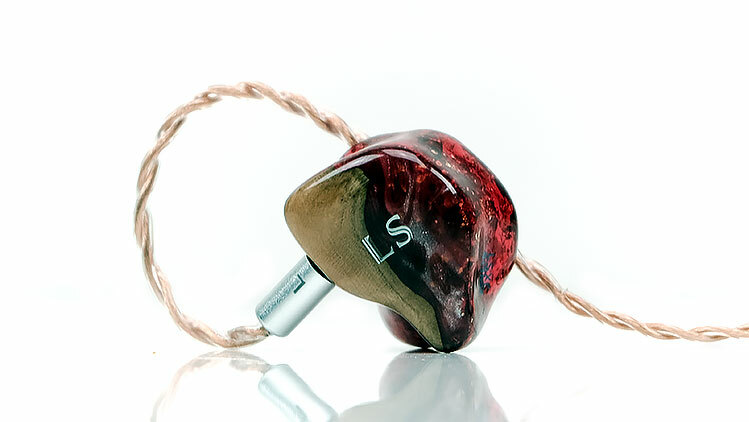 Michael has explained that the LSXC is a strategic offering that embodies their own personal preferences rather than a catch-all neutral reference sound. This is a 10 balanced armature custom monitor with a configuration of 3 for the lows, 4 for the mids, 2 for the treble and for the upper treble. 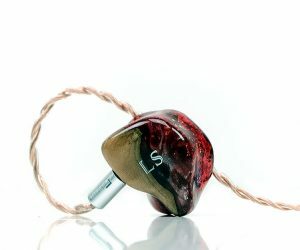 The LSXC uses a passive crossover design with some nice high-end Vishay resistors in there. These are resistors I have seen used on the StereoPravda models and they performed very well indeed. 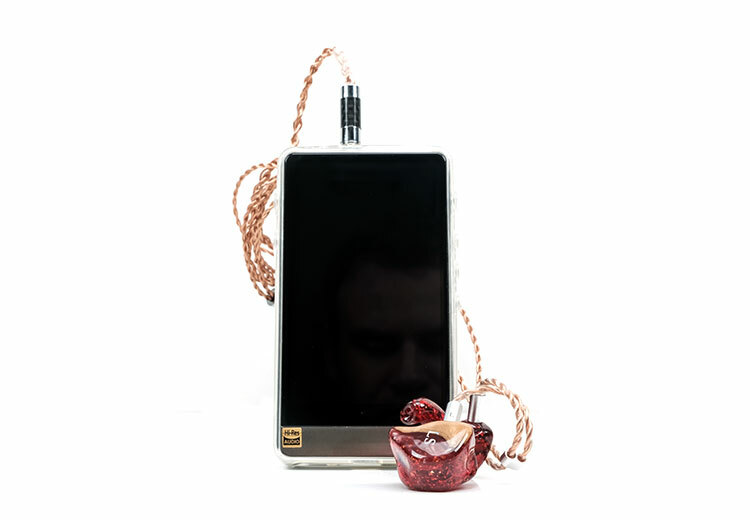 The LSXC is rated at 20Ω and 100dB so it is fairly easy to drive off most DAPs and portable amps. I do not see anything other than personal preferences when it comes to specific amping needs for the LSXC to sound optimal. Living in Asia I can detect a ‘cultured’ retail offering a mile away. 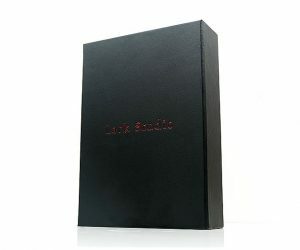 That is not to say a bad one, because Larks packaging for the LSXC is extensive and very well done. It is just that it is very Asian in its aesthetic. What does that mean? In this instance, you get lots of cardboard, satins, and suede with old-school san-serif fonts in funky dark colors. It is more boutique than corporate but certainly much more ambitious than some competing custom monitor packaging. Inside you get a generous display layout with the monitors, stock cable, airline adapter, 6.35mm adapter, and a small carry box. 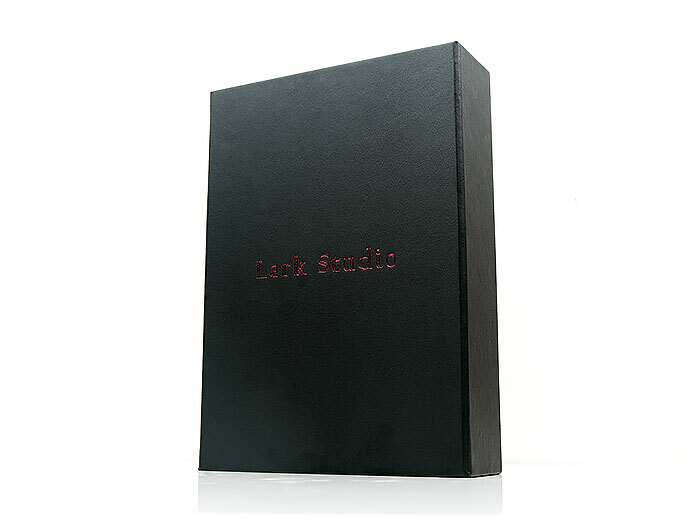 Inside the carry box, you have a small soft leather pouch with the Lark Studio moniker and a branded grey cleaning cloth. Lark Studio have also included 2 branded rubber stacking bands which I am not fussed on. If you stack great but its a thing of the past for me and some dehumidifier pillows might be more essential. 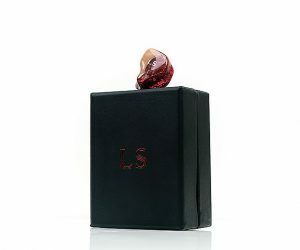 Lark build form supplied physical molds so you will have to send in your ear impressions. 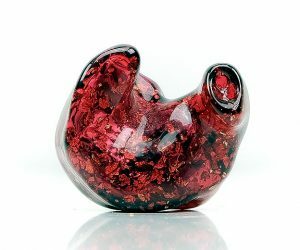 The designs I have seen to date are actually quite nice but the one that stood out for me was a fusion of wood and bright red “lava” type mix with flakes. Out of the box, it is an excellent looking build and they do fit perfectly. The LSXC also uses a recessed 2-pin 0.78mm socket and at the time of writing it does seem this is the only socket style they will offer so no MMCX or other alternatives. 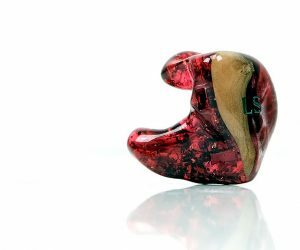 Lark uses a relaxed fitting German acrylic build on their LSXC which, if you have been following our customs reviews, means it doesn’t penetrate too deep into the ear canal. As a result, the LSX is very comfortable but not ideal for stage guys who move around a lot as they do not have the same level of secure fit. These are built for supreme comfort and lazy guys like us who spend hours on a sofa listening. The LSXC comes with two cables and I have quite a contrasting opinion on their performances even at this early stage. Technically it is a stock cable with an option to upgrade to the second cable for an additional fee. Something which I recommend because it does make a considerable difference. 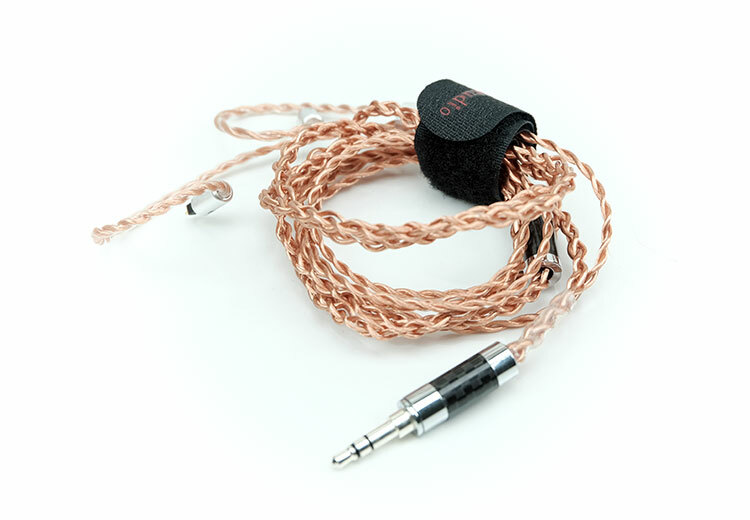 The stock cable is a nicer build than a Plastics One type black wire with a translucent PVC jacket, nice tight braid and what seems to be a 4-wire OFC copper wire. The terminations are all chrome aluminum alloy barrels with carbon fiber prints and a chrome alloy chin strap. On the whole, it is a nice looking and well-built stock cable. 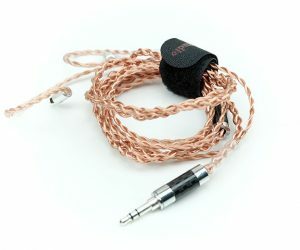 I am delighted this cable is included as an optional upgrade because it does have some dramatic improvements in the tone and staging of the LSXC over the stock cable. 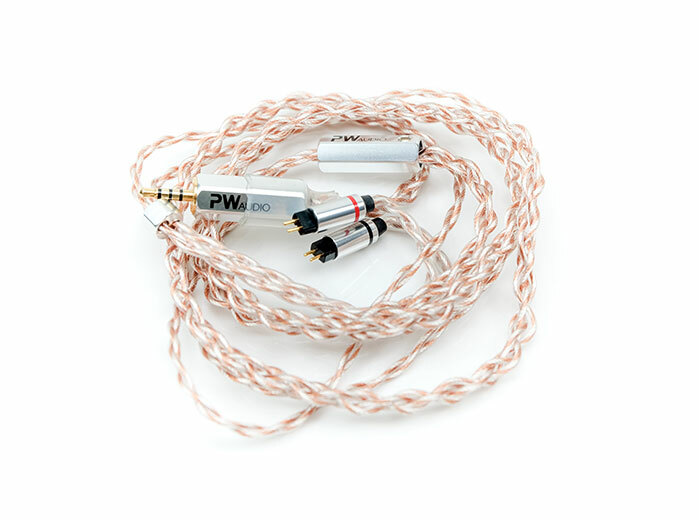 This is the 4-wire build priced at SG$439 on the PW Audio website. It is a special mix consisting of a 7 bundle Litz geometry of copper and silver-plated copper in a translucent PVC jacket. SPC does help bring out the treble presence on the LSXC and delivers a bit more air and openness to the signature over the stock which I prefer. I will try with some other 8-wire silver builds also in the main review just to get a wider perspective of how adaptable the LSXC sound can be. With the stock cable, my initial impressions are of a fairly warm and rich signature with a mid-bass bias and forward lower-mids. Instrumental timbre is smooth and rich sounding with a slight euphonic overtone. 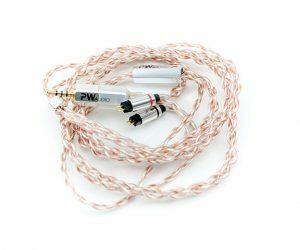 Vocals are natural sounding but their positioning seems a little more neutral and not as forward or clear sounding as with the PW Audio cable pairing seems to offer. Treble presence is relaxed with some good body but a little rolled-off in the upper treble. The PW Saladin cleans up the signature of the LSXC and takes a touch of warmth out of the timber replacing it with a little more treble sparkle and clarity. 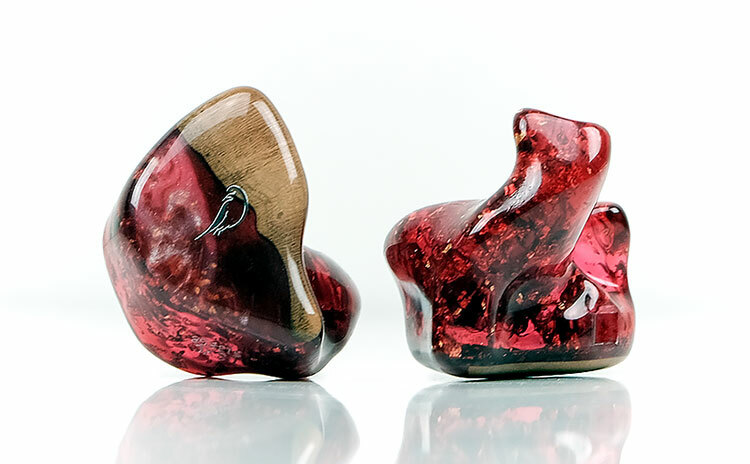 The sound still has relatively the same tuning bias but you do get a much better level of dynamic range, a more open sound and significantly better width in the soundstage. Personally, I might dabble a bit more with some other cables including some 8-wire silver options to see if I can get a little more out of the LSXC staging-wise for the main review. What you need to know for now this is a smooth and warm sounding monitor with a forgiving presentation rather than a reference tuning. 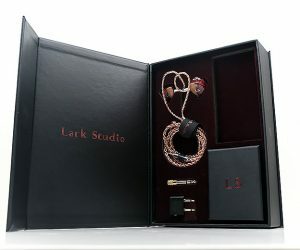 My initial impression of the Lark Studio LSXC monitor is if you like the Earsonics sound then you are not too far off with the tone of this monitor. The key for me was the PW Audio Saladin cable and cable rolling, in general, is already producing some interesting results with the LSXC. 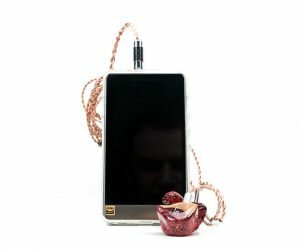 The build quality and design options look great and the craftsmanship is as good looking in the hand as they are in the supplied pics. 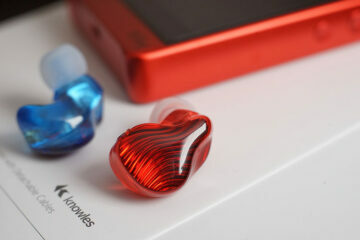 Professionally built is a good statement here so stay tuned for our full review in the coming weeks.